Fishtail Air & Air Zermatt carries out the highest longline rescue in history – Summit Helicopters Pvt. Ltd.
Fishtail Air & Air Zermatt’s team made a record breaking rescue on 29th April, 2010 using ‘human sling operation’, on Mt. Annapurna I (8091m/26,545ft). 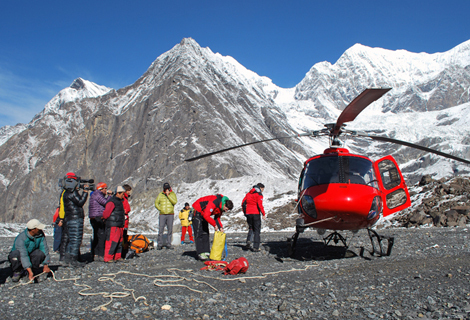 Three Spanish climbers were evacuated from 6900m by Fishtail Air’s AS 350 B3, using human sling operation. The climbers were stranded in the mountain due to bad weather for 36 hours. The rescue operation was carried out by Capt. 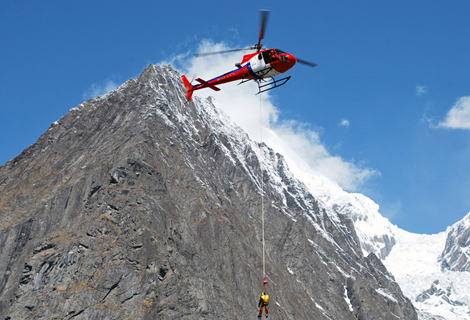 Daniel Aufdenblatten from Air Zermatt, Switzerland, while Swiss Mountain Guide, Richard Lenner hung on the sling and lifted the stranded climbers. The three Spanish climbers were evacuated with the longline, one by one and flown to base camp at 4000 meter. 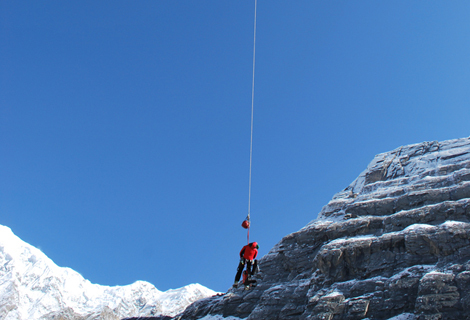 This was the highest longline rescue in history. Fishtail Air has been carrying out special rescue missions this season, together with Air Zermatt’s assistance, using it’s newly acquired AS 350 B3. Recently the team had rescued 4 Korean Climbers and 3 Nepalese Sherpas from 6,500m at Mt. Manaslu on 26th April.